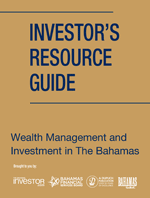 The 2019 Investor’s Resource Guide is an invaluable resource for private wealth management practitioners around the world covering tax planning issues, offshore wealth management structures in The Bahamas such as IBCs, foundations and purpose trusts, setting up investment funds, and Bahamian business incentives. This special, 32-page supplement to The Bahamas Investor offers an essential overview for setting up trusts, international business companies and other wealth management structures in The Bahamas, plus information on working and living in The Bahamas. The Investor’s Resource Guide is published in collaboration with The Bahamas Financial Services Board and the Bahamas Handbook. Read all about investing in The Bahamas in our Island Living section in the July 2015 issue of The Bahamas Investor. This special, 31-page supplement to The Bahamas Investor offers an essential overview for buying real estate in The Bahamas.